Match Clusters – Chicken or Egg? Are Match Clusters based on the genealogy or the DNA? Our Matches share both with us. In other words, do Match Clusters tend to focus around a Common Ancestor (CA) with most of the Matches or on a Triangulated Group (TG) with most of the Matches? Do we have an Ancestor first (who points to TGs) or do we have a Cluster TG first (which points to a CA)? Some have opined that a Match Cluster is the same as, or similar to, a TG. I think Match Clusters form around Ancestors, and that each of our Ancestors can be associated with only certain TGs. In other words, the Ancestors come from Clusters, and Clusters may have multiple TGs. Let’s look at what we “see” with clustering. With the Leeds Method the focus is on the 4 grandparents. I can assure you that each of our grandparents is associated with multiple TGs. I currently have 380 TGs covering 98% of my 45 chromosomes. Let’s round that to 400 TGs. This means that each grandparent would have roughly 100 TGs (or alternatively, each of those TGs would come from a distant ancestor, down to me through the one grandparent). If we have a Clustering Matrix with 4 large clusters, each one would almost certainly be from a different grandparent and maybe 100 TGs. When we look at various clustering results, we usually see 4 clusters, or 8 clusters or 16 clusters, etc. This is a tip off that each cluster represents an Ancestor at some generation. NB: Clustering is not as precise as Triangulation, and not every Match in a cluster will be from the same Ancestor. Some Matches will share multiple Ancestors with us – sometimes from both sides (Paternal and Maternal) of our ancestry. The Clustering process has a hard time dealing with that – and it is an imperfect system. And all of the Clusters may not be from the same generation – but most will be. However, taken as a whole, the Clustering process does a good job of grouping Matches by Ancestors. Each Cluster will represent an Ancestor, even if every Match in it does not have that particular Ancestor. Another way to look at this is to remember that each TG comes from one specific ancestral line (from a distant ancestor down to you). But turning this around is not true – we cannot say that each Ancestor passes down one TG. Clearly each parent, grandparent, great grandparent, etc. passes down multiple TGs. If we drop the threshold to about 60cM, we’d pick up mostly 3C (average 74cM) and closer, and we’d wind up with roughly 8 main Clusters in a Matrix – one for each of eight Great grandparents. At AncestryDNA, they use 20cM as a threshold for 4C, but we’ve experienced many actual 5C-8C in this mix. From the Shared cM Project we have the average for a 6C at 21cM, so I’m pretty sure the 20cM threshold will pick up some 7C and 8C, too. In any case, when I ran the Genetic Affairs Match Clustering program (using a 20cM threshold download from DNAGedcom Client), I got 3571 Matches and 158 clusters. That’s pretty close to 128 clusters, with one from each 5xG grandparent. This means to me that there were a number of 7C in the mix from 6xG grandparent couples, with a few more 8C Matches which split some of the clusters and brought the total up to 158. This seems to be a reasonable outcome as some of the clusters are only 3 Matches. So my conclusion is that Match Clustering results in clusters around your Ancestors. And each cluster may include more than one TG. By selecting a threshold, you can roughly target the generation you want – 200cM for 4 grandparents; 60cM for 8 Great grandparents; 30cM for 16 2xG grandparents; and 20cM will get you roughly 128 5xG grandparents. It gets fuzzier with lower thresholds, because these lower thresholds can be from a range of cousinships. The next, very important, step is to tag each cluster with the most logical CA (most from one generation). Over 230 of my AncestryDNA Matches are in known TGs (from uploads to GEDmatch or tests at other companies). In these cases some TGs might also be tagged to each cluster. This is exciting, because each Cluster can then point to a CA and selected TGs that the other Matches in the Cluster will likely have. I’ve already used the CA clues to find CAs for other Matches, and noticed that some Clusters tend to have only one or two TGs… Very important, and useful, clues! In genetic genealogy, there are two fundamental building blocks: Ancestors and DNA Segments. As genetic genealogists, virtually everything we do revolves around these two key elements. The Ancestors are really Common Ancestors (CAs) with a Match; and the DNA Segments can be grouped into Triangulated Groups (TGs). See How To Triangulate here. Each of your TGs is really a DNA segment (on one of your Chromosomes) that came from an Ancestor. Common Ancestors (CAs) – see my Shorthand ID for a CA here. Triangulated Groups (TGs) – see my Shorthand ID for a TG here. Reasonable. Suppose I have a cousin/Match: 36P/4C on 01S24, with a 38.7cM shared segment. This looks reasonable. CA 36P has an ancestral line down to me as: 36-18-9-4-2-1, so it agrees with the 2-4 in 01S24 and both are on the P-side. And 38.7cM is in the range for a 4C. Unreasonable. Suppose I have a Match on TG 01S24, with a 38.7cM shared segment, and then find a Common Ancestor 856M – I quickly know there are issues. 856M is a Maternal Ancestor and 01S24 is a Paternal TG. Also if the Match shares 38.7cM, the CA is not likely to be as far out as CA 856 [8th cousin range]. Very helpful. These two fundamental building blocks, and their shorthand IDs, are very valuable in analyzing various CAs we may find in a TG; or in reviewing a list of InCommonWith or Shared Matches, or Match Clusters. It takes some work to type them into the Notes boxes (at AncestryDNA, MyHeritage, FTDNA), but they sure are handy and helpful with analysis of groups. I’ll blog more about how to use these building blocks. Finding CAs is genealogy work! We have to do this work – by reviewing a Match’s posted information or by contacting them (and sometimes by building their Trees). Forming TGs is a mechanical process – also work! I recommend trying to get as many shared DNA segments as you can into the appropriate TGs. Grouping your segments into TGs will save you time in the long run. See The Benefits of Triangulation here. Your TGs and CAs have certain specific links. Each TG will be linked to a specific ancestral line – often including several CAs at different generations with different cousin/Matches (aka Walking the Ancestor Back). Each CA will be linked to only certain TGs. Distant CAs may have only one TG; Intermediate CAs may have a few TGs and Close CAs will be linked to several TGs. See Figure 3 in this blogpost for an idea of how many segments (TGs) ancestors at different generations are likely to have. The point is that each of your Ancestors will link to only certain TGs, or none. – S indicates, roughly, how far out on that Chromosome the TG starts. Each letter is roughly 10Mbp wide. “A” means the TG starts between base pair 1 and base pair 10,000,000 (or 10Mbp); “B” means the TG starts between 10 and 20Mbp; “S” means the TG starts between 180 and 190Mbp. In fact, my TG 01S24 covers 182-229Mbp; and the next TG along Chromosome 01 is 01X24. I’m not a slave to this “rule,” and adjust where it makes sense. NB: Everyone will have a uniquely different chromosome map, and their TGs will have different locations. – 24 indicates the grandparent in Ahnentafel. When I can determine a TG is on my Paternal or Maternal side, I use 2 or 3 respectively. When I can determine the TG is on a particular grandparent, I use 24, 25, 36 or 37. I only carry it out two generations (so far). NB: some people use P or M (for Paternal or Maternal), instead of Ahentafel numbers – take your pick. 01S24, 38.7cM = A Match segment in TG 01S24 which is 38.7cM. In my spreadsheets, Notes and analyses, I refer to Common Ancestors (CAs), or Most Recent Common Ancestors (MRCAs), by their Ahnentafel numbers. Most of the time the MRCA with a Match is a couple, and I use the Ahnentafel number of the husband. For example: 36P is my father’s father’s mother’s father’s father (or 1-2-4-9-18-36 with the Anentafel number for each generation). This 36P shorthand actually refers to the 36/37 couple (Thomas NEWLON and wife Susan in my case). I add on a P or M to indicate the Paternal or Maternal side, as this is not obvious with larger Ahnentafel numbers after several generations. Just to keep my bearings, I also usually indicate the cousinship of a Match – for example: 4C (4th cousin) or 4C1R (4th cousin once removed), or 3Cx2 (double 3rd cousin), or 2C/2 (half 2nd cousin). So the shorthand ID is usually something like 36P/4C1R – a lot of information packed into a compact ID. And, given this shorthand ID, I can always repeatedly divide the Ahnentafel number by two to get back down to me. For example: 856M breaks down to 428-214-107-53-26-13-6-3-1 (me); which is on my mother’s father’s side. I can easily tell that other Matches with 214M and 53M and 13M MRCAs are all on this same ancestral line. Let me start by saying this Icicle methodology, here, has not been as useful or accurate as I thought it might be. I don’t want to steer the readers of this blog in the wrong direction. I’ve used this Icicle method and expanded the number of my columns of icicles a lot. Some of them turn out to be very helpful, with many Matches from the same Ancestral line and/or from the same Triangulated Group (TG). However, many are not so helpful. After all, these Icicles are just In Common With (ICW) lists. ICW lists are found at AncestryDNA (called Shared Matches); at FamilyTreeDNA (called In Common With); at 23andMe (called Shared Relatives); at MyHeritage (called Shared DNA Matches); and at GEDmatch (called People who match both kits). Just a reminder: to get an ICW list, the program starts with a list of all your Matches (at that company) and compares your list with a list of all the Matches of a “base” Match (which you select) – the ICW list is a list of all Matches which are on both lists. In other words, the comparison is based on Match names, or kit IDs, and nothing more than that. In general, you and your selected base Match will have a shared DNA segment and a Common Ancestor (CA). Your ICW Matches may, or may not, share the same DNA segment and/or the same ancestral line. This provides powerful information when there is such an alignment; but it’s just a list of data – not much help – when there isn’t an alignment. The good news is that 23andMe and MyHeritage both tell you when there is shared DNA alignment with a Match. 23andme puts a “Yes” in their Shared Relatives list; and MyHeritage adds a Triangulation “icon” in their Shared DNA Matches list when the ICW Match aligns (or Triangulates). GEDmatch lets you compare two kits, so you can check for a shared DNA segment; and their Tier1 Triangulation tool will list the top Matches which Triangulate. Since FamilyTreeDNA also provides segment data, we can check Matches in an ICW list to see if they are on the same overlapping DNA segment that you and the base Match share. This means they are in alignment over 95% of the time; virtually 100% of the time when there are multiple (say at least 4, not closely related) Matches who meet this ICW AND same segment criteria. See also the DoubleMatchTriangulator*. The above segment Triangulations are a much more accurate and reliable way to group (or form Clusters of) Matches. However, this process is not available through AncestryDNA (although segment Triangulation can be accomplished on AncestryDNA kits uploaded to GEDmatch). For AncestryDNA Matches a good process is clustering Matches into groups – a good way to analyze your Matches at AncestryDNA – a step up. One method to cluster Matches at AncestryDNA is the Leeds Method* – usually used to form cluster groups at the grandparent level, although some are pushing this a generation or two farther. At those more distant levels, some amount of judgment is needed. Another method is my Icicle method, here, but this has turned out to be a lot of work, with mixed results – sometimes a good, helpful, thread is found; often one is not easily found, or one may not exist. There is no “rule” or argument that says an ICW list must have an ancestral thread. It’s logical that one may exist, given that you and the “base” Match have a Common Ancestor, and therefore some of the ICW Matches may have a higher probability of having the same CA. One tactic is to group the Icicles by ancestral lines or TGs, by moving such Icicle columns to be adjacent to each other and noting a common thread. However, it’s probably somewhat easier to use one of the tools below. Several new methods for automatic Clustering have come out recently. GeneticAffairs* (small fee) now has an AutoClustering tool that puts all of your Matches (above a threshold) into a matrix, noting which are ICW each other, and then grouping them into matrix “boxes”. These “boxes” have a high probability of the same Common Ancestor, because there are multiple Matches in alignment with each other. Depending on the threshold, you might get 8 or 16 or 32 matrix “boxes” – representing 1, 2, or 3xG grandparents. NodeXL* also forms AncestryDNA Match clusters. And DNAGedCom Client* (small fee) has recently added a clustering tool. Ideally these matrix “boxes”, or clusters, will group many of your Matches under the correct ancestor. They result in high probability outcomes; however, they are not perfect. Close cousins may be from several of these ancestor clusters and thus cause some confusion in clustering. But usually we know where the close cousins go. Also some Match cousins may share multiple CAs with you. BOTTOM LINE – The best Clustering technique is Segment Triangulation – basically guaranteeing a Common Ancestor on a specific segment, IMO. I have a total of about 380 TGs that cover all of my DNA. Segment Triangulation is available for all the companies, except AncestryDNA. For Ancestry DNA, there are several Clustering techniques, noted above, that can be used to group Matches. With about 20 million atDNA tests taken, we now have many Matches and lots of data. This blogpost describes one method (a “hack”) to manage some of that data. In this case, I’m trying to squeeze more information from my AncestryDNA Matches. Ancestry doesn’t report shared DNA segment data, but they do have several unique features we can put to use. In preparation, we need two things: Notes, which I’ve posted on here and here; and a spreadsheet of all the Matches. Notes. When known, I’ve been entering #A (with the Ahnentafel number and surnames of our MRCA Ancestors) and #T (with the Triangulated Group ID#) into the Note box on the DNA page for each Match at AncestryDNA. I have over 1,000 Hints, so I have a #A entry in the Notes box for each Hint. For hundreds who have uploaded to GEDmatch (or used another company too) I have a #T entry in the Notes box. This data is very helpful, but not essential. Spreadsheet of Matches. I have downloaded my 83,000 AncestryDNA Matches to a spreadsheet. This spreadsheet includes the Match name, the Admin, total cMs, all my entries in the Notes boxes, a URL link to the Match, and a URL link to their Tree. This is a great tool for exploring and managing my AncestryDNA Matches. I use DNAGedCom Client for a fairly quick download (small subscription fee). So I took my spreadsheet (which is sorted on total cM) and added about 20 columns. I then chose an interesting 4th cousin (4C) Match and clicked on Shared Matches (SM). I then put a “1” in the first blank column of my spreadsheet for this 4C Match and also for each of our SMs. Since I started down the list with a middle-of-the-pack 4C, some of our SMs are higher in the spreadsheet, and some were below the SM I started with. (I yellow-highlighted the 1 for the SM I started with – to remind me who I started with). Note that the SMs are all classified as 4C or closer by AncestryDNA, although I’ve found a number of them to be really 5C or even 6C. But that’s OK – these “4C” Matches result in a manageable group of Matches – about 3,000 out of the total of 83,000. So I was working with the top 3 percent of my Matches – all sharing at least 20cM with me. This process resulted in a column with 1’s in it, generally spread out over all of the top 3,000 Matches. Next, pick another interesting 4C (your choice – I picked one I knew was a real 4C on a pair of 3xG grandparents I’ve done a lot of work on and with whom I have several established Triangulated Groups (TGs) from the other companies. I went to the next column and entered a 2 and yellow-highlighted that 2. I then ran Shared Matches on that Match, and put a 2 in the same column for each one of the SMs – again, some were closer cousins, higher in my spreadsheet, and some were lower, getting down to the end of the 4C SMs. Again, another column with all the same number. I made a blank row at the top of my spreadsheet with the numbers 1 to 20 in that row, and then froze that row, so I could see it as I scrolled down. I chose more 4C Matches which did not yet have a number, gave them a yellow-highlighted number, ran the Shared Match for each and repeated the process. Figure 1. 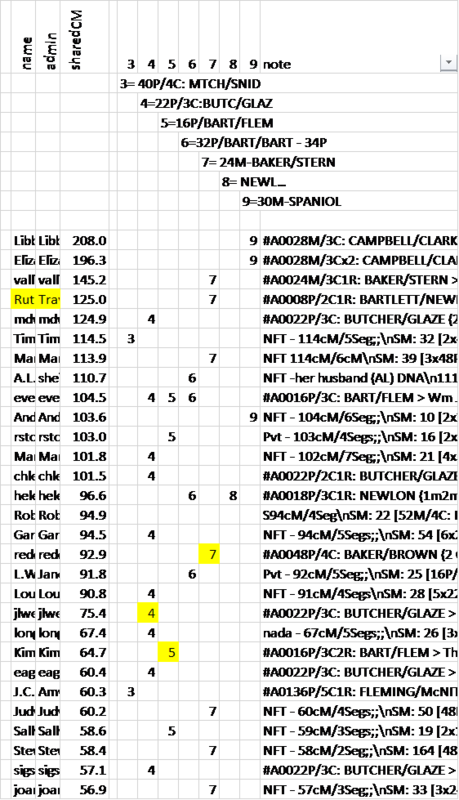 Portion of Spreadsheet showing headers, columns Notes and icicles. Down the spreadsheet, these numbers began to look like icicles hanging down. Nearer the top portion of the spreadsheet, some of the Matches had several numbers, and very near the top some of the Matches had many numbers. Think about this! We are actually looking at an upside down Tree – the trunk at the top and the various large branches (multiple numbers) hanging down, gradually separating into individual branches representing individual ancestors at the 4C or 5C or 6C level. This is as it should be! If we keep going we should find 16 couples at the 4C (or 3xG grandparent) level. Some more will be there because we are actually dealing with some 5C and 6C in the AncestryDNA “4C” category. Time out for reflection on this process. This methodology is not as finite or rigorous as forming a Triangulated Group – which TG has only one basic solution. TGs are based on segments. These icicles are based on genealogy relationships. The SMs actually have In Common With relationships, and some of them don’t share the same Common Ancestors with you and the base Match. The SMs may relate in different ways, and thus not really all be on the same ancestral line. This often shows up in the spreadsheet when a 4C Match down the list winds up with numbers from more than one icicle. Often, in the Notes for that Match, it’s possible to determine which ancestral line (icicle) they belong. In this case I color their other icicle number red (for wrong icicle). Another way to tell which ancestral line icicle is correct is to take a 4C Match (down the spreadsheet with multiple icicle numbers), and set them as the base, and run the Shared Match list. Usually it will be very clear that their SMs are on one icicle and not on the other icicle(s), maybe with one or two exceptions due to endogamy. If it really looks like that Match is creating an ambiguous mess, highlight that Match row in red and focus on the more “well behaved” Matches. Remember, this is just a process and tool for you to use. You are in charge. Don’t become disoriented by a few Matches. Look at the big picture, and come back later – maybe much later, when the “dust has settled” and see if you can rationalize those few Matches. Another thing to watch for is basically duplicate icicles. This happens when you pick a new 4C Match as the base, and the SMs wind up being almost exactly the same as a previous icicle. In this case merge the two columns. In any case use your judgment – if you want to keep the two, slightly different, icicles, OK; if you want to merge them, OK. At the end of the day it won’t make much difference. At some point, after you have created many different icicles, it’s time to check your Notes (with MRCA and/or TG info in them) see if you can determine an ancestral thread running through the icicle. At the top of my spreadsheet, I inserted about 20 rows (one for each icicle column) and added the numbers in a diagonal fashion – like a matrix – with each number in its respective column and on a separate row. After each of these numbers I added a description that I felt best described the icicle – usually an Ahnentafel number with the surnames of the MRCA couple; or the TG ID# if that seemed to be the theme of the icicle – there being no consensus on the MRCA yet. I am now in the process of rearranging the icicle columns based on information from the 2C and 3C Matches. Done correctly, this will wind up with all the paternal icicles on one side and the maternal icicles on the other side of the 20 columns I started with; and within those two sides will be the split between the grandparents (an objective of the Leeds process which has a similar methodology). Theoretically, by using 4Cs, we should be able to sort out the 16 MRCA couples with an icicle for each – or maybe two or more icicles for each of these 3xG grandparent couples. It depends on how far down the list we are willing to go. Note that the process of forming these icicles does not depend on genealogy knowledge. I am using this process now for a friend with an orphaned grandfather. It would be the same process for an NPE or adoptee at the grandparent level. I’m winding up with multiple icicles, and with some info on the other 3 grandparents, I’ll determine which icicles are from the target grandfather. Then I’ll combine all the downloaded surnames from those Matches, combine them into one spreadsheet, sort on surnames and then analyze the surnames that look promising. I’ve already found a new surname for one of my own brick walls this way. I’ll review that process in a separate blog post, because it can be applied to any icicle which includes Matches with Trees. On a side note about this icicle process… On almost every icicle I formed, I got distracted. For most of them I started with a 4C Match for whom I had a pretty firm MRCA and/or TG. As I worked down the Shared Match list, I’d see a Match with a 20-people Tree. I clicked on the Match and often quickly found a clue to follow, and it often led to the same MRCA. And now at AncestryDNA, we can see “Unlinked Trees” – BINGO! That sometimes led to an MRCA too – usually on the same ancestral line. It was like picking the low hanging fruit all over again. I had to force myself back to the boredom of filling in my icicles. It is work! But it appears to me that these icicles, like TGs, will each provide a cluster of Matches which is very helpful. Extra Credit…. I have over 1,000 Hints – almost all of them with valid MRCAs. However, most of them are also more distant than 4C, some with fairly small shared segments under 10cM. But most of them have some Shared Matches. All of these SMs are all 4C or closer – I’m now going to see how many of these Hint Matches with MRCAs can be linked back to one of my icicles. Maybe these little cM Matches with MRCAs will give me important clues for the icicles. This is because a 6C Match can have 4C Shared Matches, even though the 4C Matches do not show the 6C in their Shared Match list. So it is worth my time to start with the 6C Matches with an MRCA Hint and see which 4C icicles they match. Summary: Download or make a list of your top (closest 2-3%) Matches and group (or cluster) them through Shared Matches. I found it relatively easy to do this with a spreadsheet. It’s work, but provides interesting insights. The icicles formed are a tool to help us analyze our Matches. Often this lets us impute ancestral lines and/or TGs to other Matches. Edit 20181030 – a portion of my speadsheet has been added as Figure 1. The Names and Admins were condensed for privacy. The Notes field has many “shorthand” entries that I have entered at AncestryDNA, and they are included in the spreadsheet download. I have been religiously typing information in the AncestryDNA Notes box – for all Hint Matches and as many 4C Matches as I can (because they show up as Shared Matches). I use the MEDbetter Chrome extension (google it) to display all of my Notes, all of the time. This is particularly useful in the list of Shared Matches – to get a sense of a cluster of Matches. I’ve blogged about using the Notes box: format and usefulness. #T for a Triangulated Group (TG) identification code (ID) – e.g. #T[01S24] means the TG is on Chromosome 01; the letter indicating the start location: roughly 10Mb for each letter (A = 0-10Mbp; S = 180-190Mbp); the two numbers after the letter indicate the first two generations of the Common Ancestor (CA) – in this case, on my father’s father’s line (using ahnentafel numbers). A lot of info is in the TG ID. #A for the Ahnentafel number of a CA – e.g. #A0018P for my ancestors: John NEWLON 1798-1872 [Ahnentafel 18] married Mariah ALLEN 1805-1882; the P reminds me it’s on the Paternal side. A lot of info in the #A code. I don’t really use the MEDbetter hashtag filter feature because it doesn’t consolidate for me; but I love MEDbetter for displaying the Notes all the time. HOWEVER – I just tried the AncestryDNA Search feature and was blown away! I typed in [01S24] in the search box, and selected: Notes (this test). In 1 second it displayed 31 hyperlinked Matches with [01S24] in the Notes box! WOW!! What a way to review all of my Matches with one TG tag; or to view a cluster of Matches that you attributed to a Common Ancestor; or to find the Match with a GEDmatch kit you typed into a Note box. A lot of different ways to sort, find and group your Matches. BOTTOM LINE – You can search on whatever you put into the Notes box! EDIT: The Ancestry Search Notes option is added by the AncestryDNA Helper Extension in Chrome – it is required to do these searches. MedBetterDNA is not required to use the Search Notes option.